You may quibble with how Trulia values your home, but the real estate website provides an impressive interactive map with detailed views of social and environmental variables. 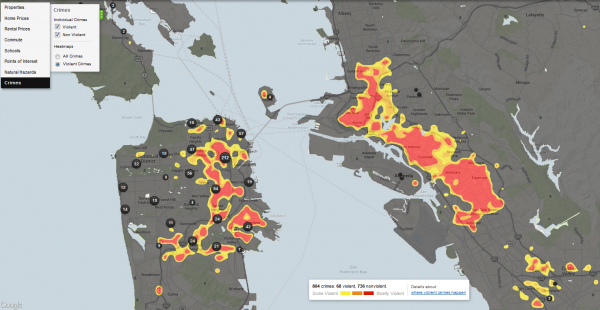 In addition to offering a treasure trove of information on real estate down to the parcel level, Trulia’s mapping engine also visualizes high-resolution data on things like commute times and the risk of wildfires, flooding, and earthquakes. Below I describe some of my favorite features and share some screenshots. 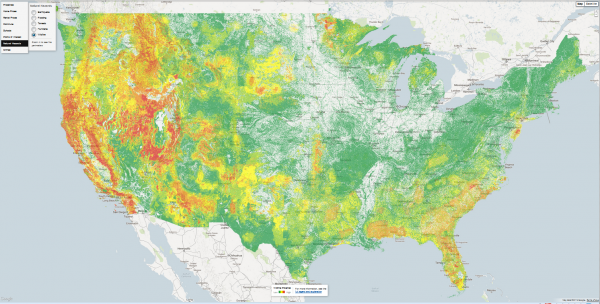 This mapping tool is not without its issues, but it’s generally well-designed and easy to use. 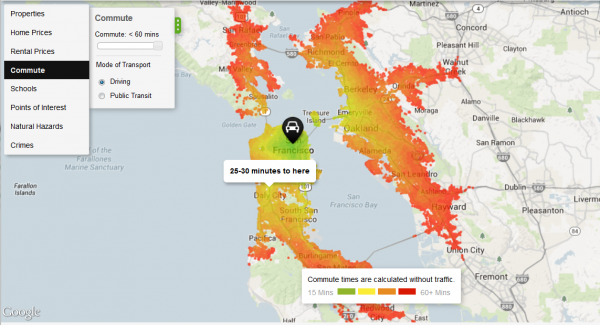 One of Trulia’s most interesting features is a layer that maps commuting times. Below are the heat maps for San Francisco, first for driving and then for transit. 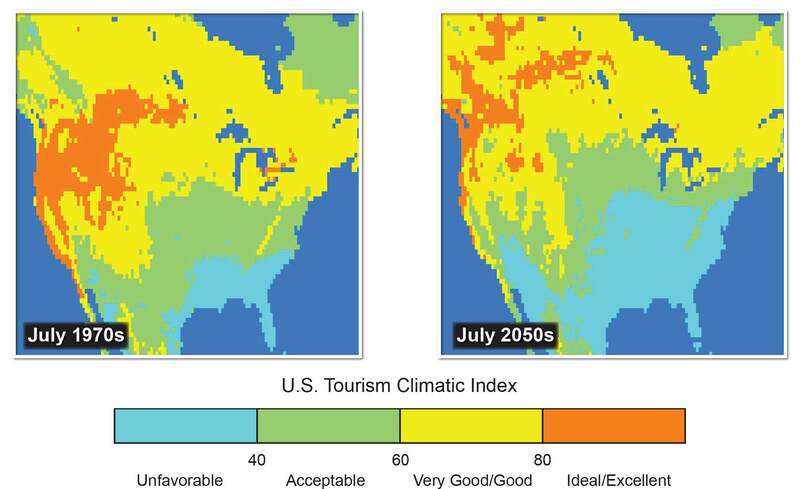 The two maps are pretty close. 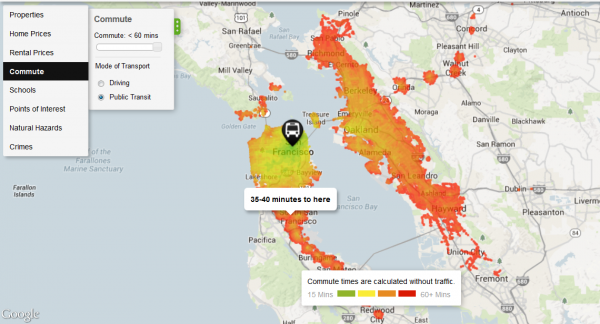 Putting aside transit strikes, the Bay Area has a solid system of trains, buses, ferries, and other alternatives to driving, so commuting long distances by transit is feasible, even mandatory, for many residents in the region. These maps don’t account for traffic delays, which is a big caveat. Click on images to enlarge. 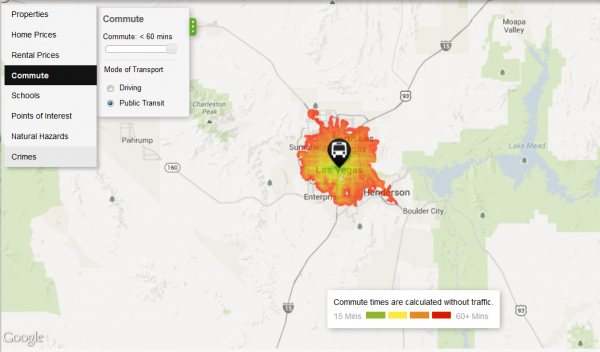 Compare the pair of images above to the ones below for Las Vegas, where there’s a huge disparity between driving and public transit commuting times. If you give yourself an hour to commute to the city center, being able to drive opens up many more places to live around Las Vegas. 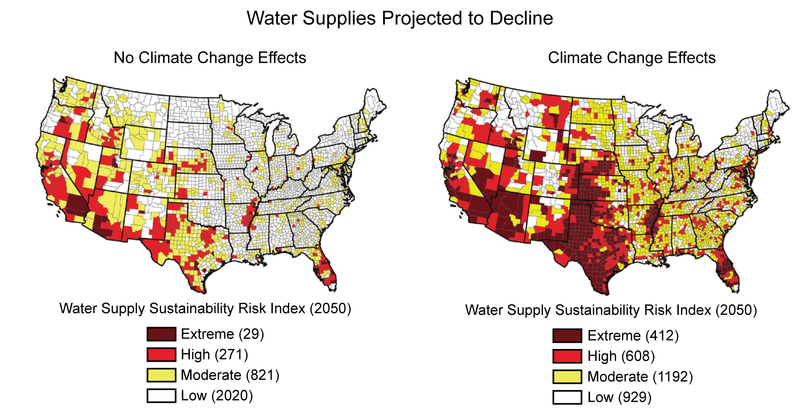 Another useful aspect of Trulia’s map is a collection of natural hazard maps, including depictions of the risks of flooding, wildfires, tornadoes, earthquakes, and hurricanes. One criticism is that the mapping engine doesn’t let you export your views, so you’ll have to rely on screenshots. It’s also difficult to zoom out and see the entire country. You can get around this by zooming out on your browser (press control and the minus sign), which is what I’ve done for the national maps below, but then the text is microscopic. Trulia works best when zoomed in to a region or metro area. 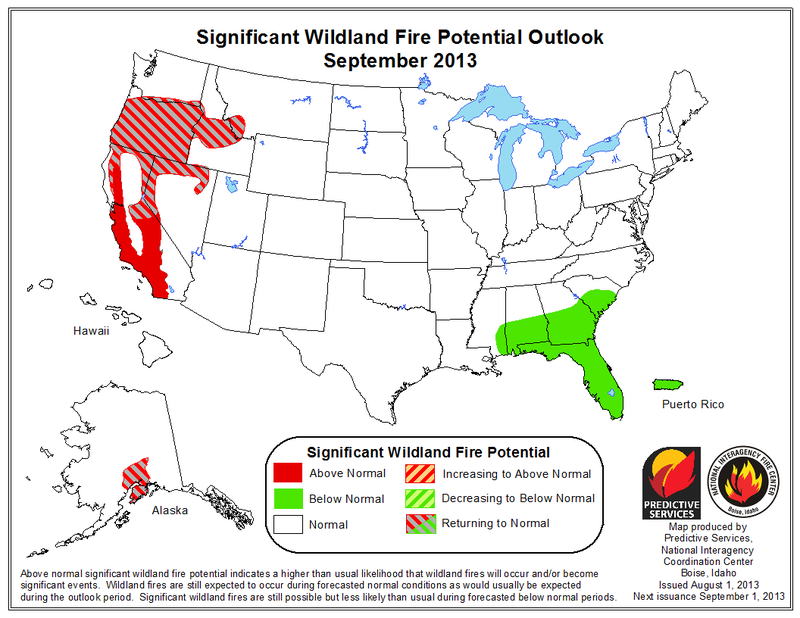 The map below shows wildfire potential across the country and illustrates the inherent risk of an area experiencing a severe blaze under the right conditions. Areas with high WFP values represent fuels with a higher probability of experiencing a high-intensity fire under conducive weather conditions. Areas with low WFP values, therefore, represent a low probability of experiencing a wildfire. The WFP map is maintained by the USDA Forest Service, Fire Modeling Institute, and is intended to be used in analyses of wildfire risk at regional or national scales. The WFP is not intended to be a forecast or wildfire outlook, as it does not include information on current or forecasted weather or fuel moisture conditions. If you zoom in close enough, the wildfire data also includes perimeters of previous fires. Below is the fire potential around Los Angeles, including the outlines of fires during 2007, a particularly active year. At least in this part of the country, extremely high fire danger areas lie in close proximity to places where the risk is virtually nil. If you zoom in to some other regions, the data may get a little funky. Below is a close-up of the Denver area. 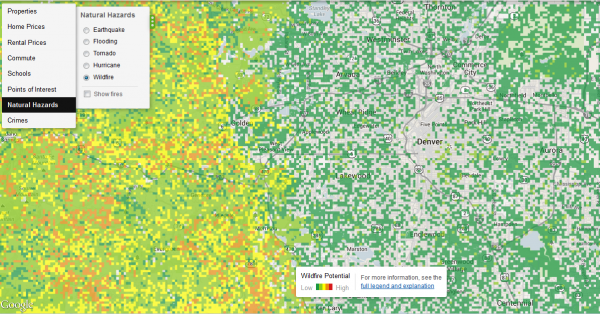 In the city, the pixelated data suggests that some city blocks have a greater wildfire risk than others, but in reality you’re not going to see a wildfire within the Denver city limits. The map is basically right: as you move west, into the foothills of the Front Range, wildfire potential definitely increases, but at this resolution the map is somewhat misleading. Another limitation is that Trulia is missing data for some parts of the country. 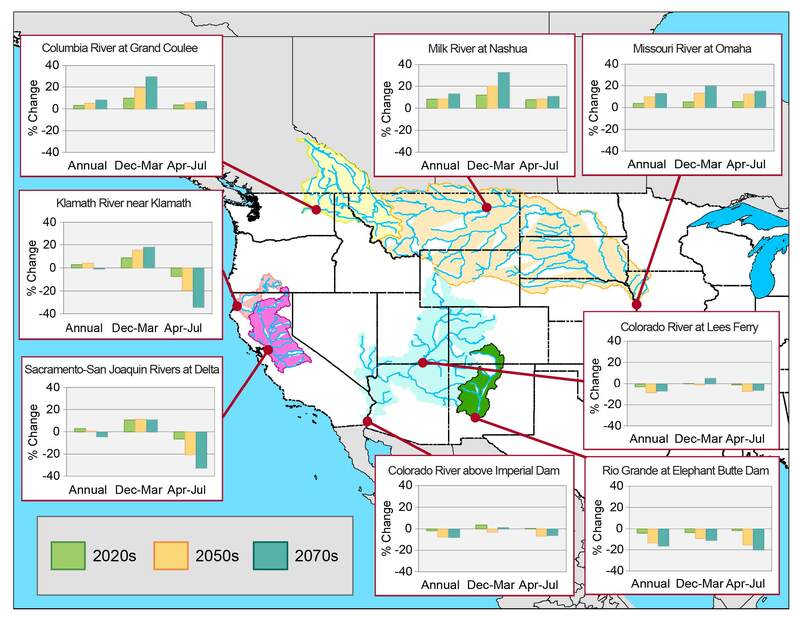 In the screenshot below, flood risks suddenly disappear north of Denver. 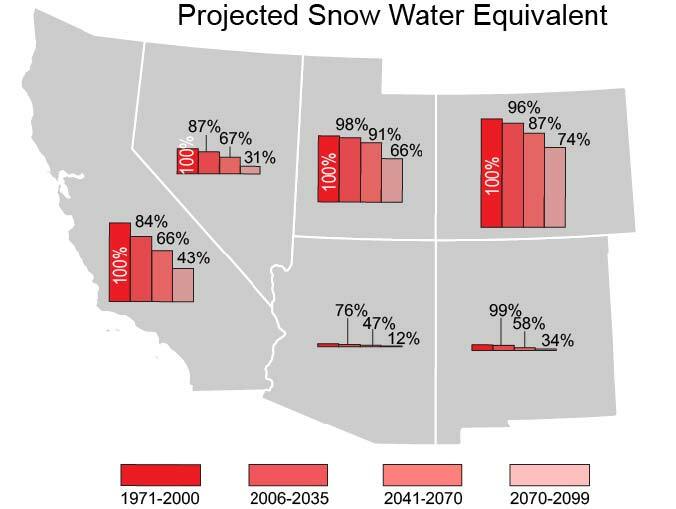 That’s because there’s no data for Weld County. Trulia cautions that even counties with flood data from FEMA don’t necessarily have full coverage. 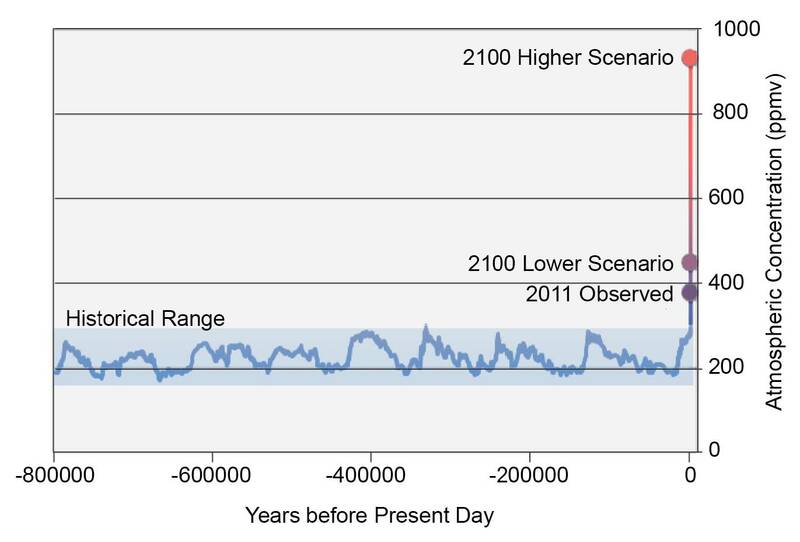 In high risk areas, there is at least a 1 in 4 chance of flooding during a 30-year mortgage. All home and business owners in these areas with mortgages from federally regulated or insured lenders are required to buy flood insurance. 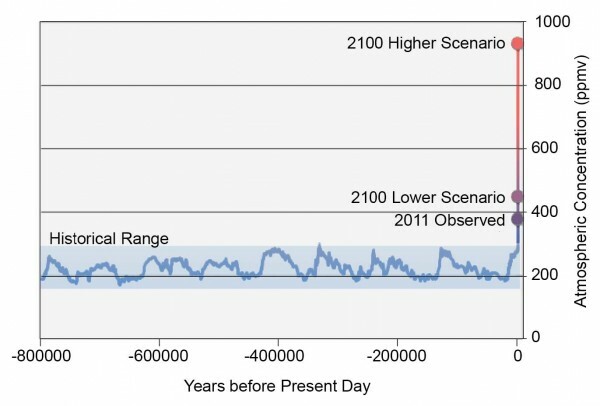 In moderate risk areas, the risk of being flooded is reduced but not completely removed. These areas submit over 20% of NFIP claims and receive one-third of disaster assistance for flooding. Flood insurance isn’t federally required in moderate-to-low areas, but it is recommended for all property owners and renters. 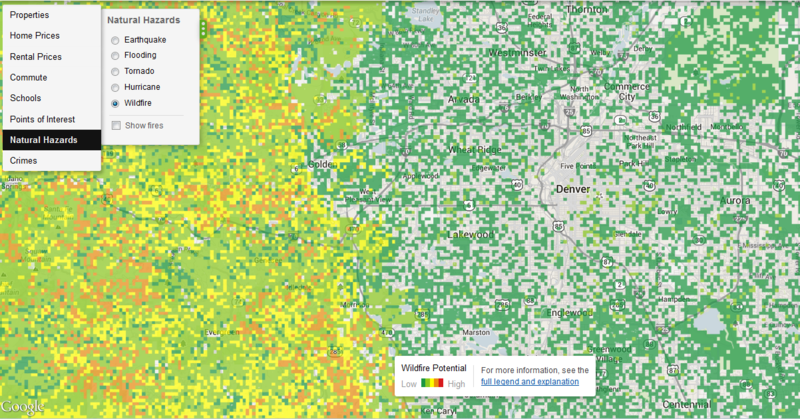 Although Trulia’s flood risk data may be spotty, covered areas are mapped in great detail, as shown in the map below of Boulder, Colorado, which recently experienced epic flooding. 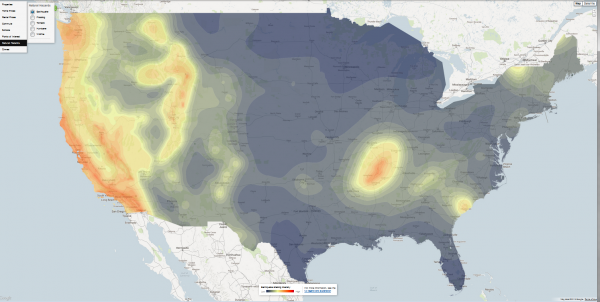 Trulia’s tornado hazard map, based on data from the National Weather Service’s Storm Prediction Center, shows that this weather phenomenon is largely absent from the American West. 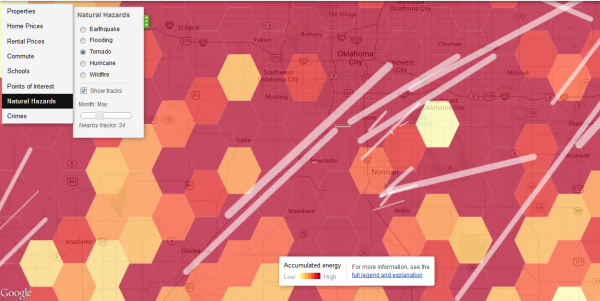 Drill down to the local level and the map shows the tracks of previous tornadoes. Below the national map is the area around Oklahoma City. I chose the month of May, when disasters such as the Moore Tornado of 2013 have occurred. 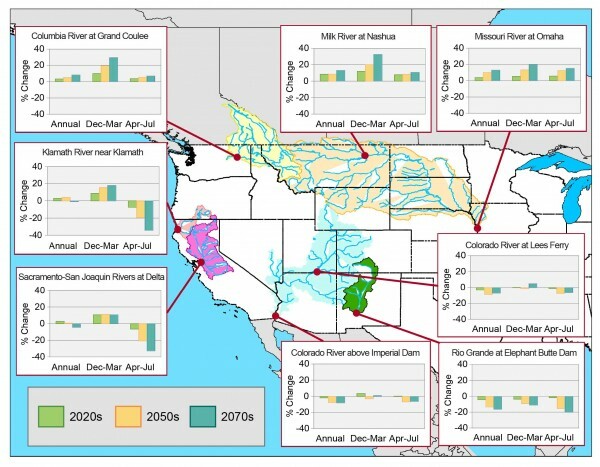 This map uses a technique known as hexagonal binning, which employs a honeycomb grid to aggregate and visualize the data. 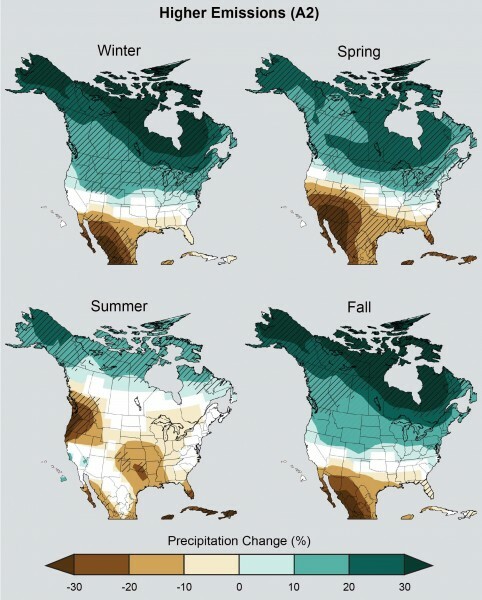 The data represent a model showing a 10% probability that ground motion will reach a specified level within 50 years. 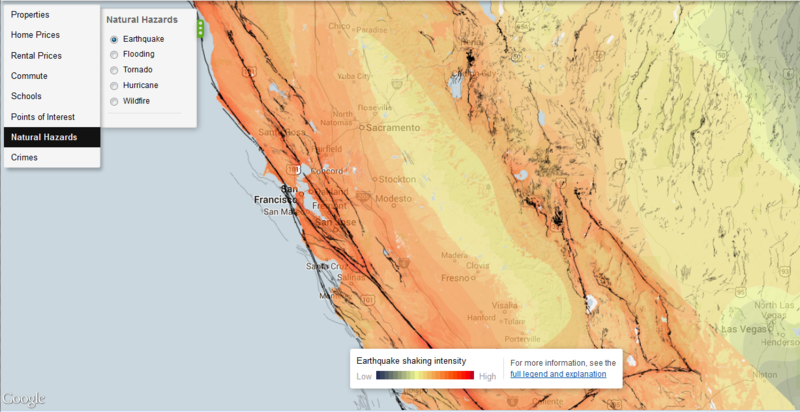 Shaking potential is calculated considering historic earthquakes, slip rates on major faults and deformation throughout the region, and the potential for amplification of seismic waves by near-surface geologic materials … Faults are represented as black lines on the map. Darker lines signify a larger slip rate, which is a measurement of how fast one side of the fault slides past the other side. Everyone knows California and the West Coast is earthquake country, but I hadn’t realized how many other, inland areas are also susceptible to shaking. Below the national map is a close-up of central California. 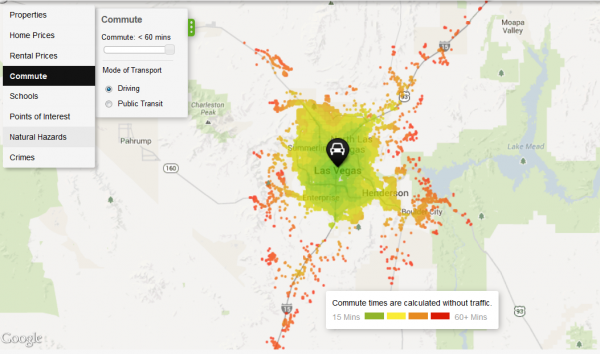 I was pleasantly surprised by the richness of data in Trulia’s maps. Its main competitor, Zillow, doesn’t have anything that comes close. Even if you’re not in the market for a house or thinking of selling, the website is a useful resource for learning more about your community. The geography of crime, shown below for the Bay Area, is a bit beyond our bailiwick here at EcoWest, but it’s certainly a key driver of growth and land-use patterns that have major environmental consequences (see this Trulia post for more on these crime maps). Using Trulia, journalists, NGOs, researchers, and local policymakers can piece together a compelling portrait of a city or region by visualizing geographic patterns in crime, housing, transportation, education, and environmental hazards. The Rim Fire burning in and around Yosemite National Park is generating national headlines due to its vast size and its threats to San Francisco’s water supply, the park’s majestic sequoias, and thousands of homes. 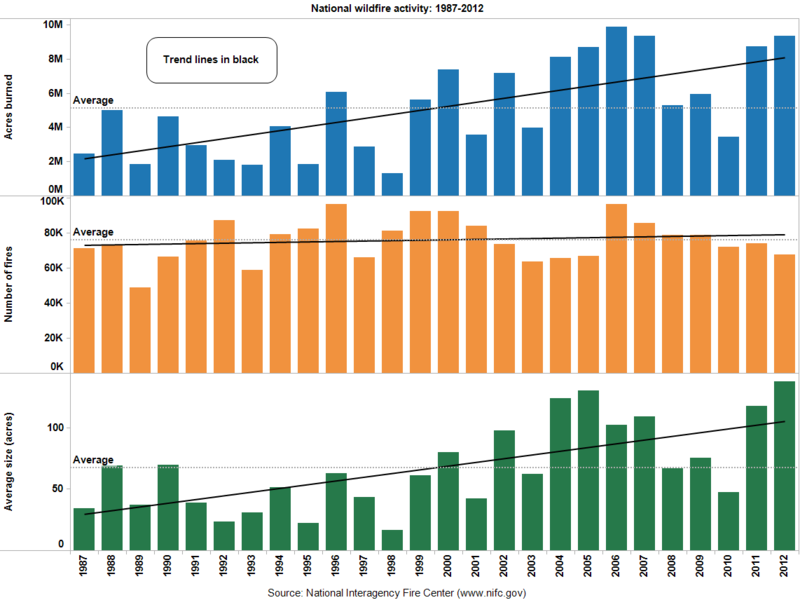 To put this fire in context, I’ve created a few of graphics that summarize recent fire seasons in California and the national picture thus far in 2013. 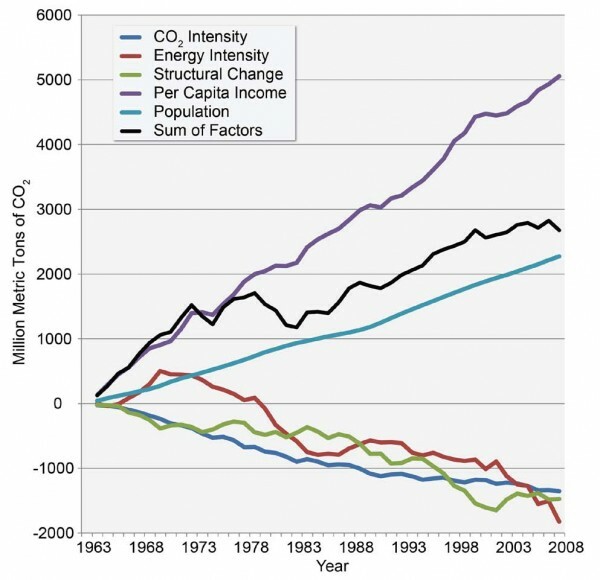 You can download the PowerPoint deck and data at the bottom of this post. Before getting to the data, let me first share some compelling views of the Rim Fire. The nearly 190,000-acre blaze is big enough to be visible from the orbiting International Space Station. Here’s a photo that astronaut Karen Nyberg tweeted on Monday. Here’s a time-lapse video, posted by park staff, that shows the Rim Fire’s growth. You should also check out this stunning video of the fire, filmed from the perspective of a C-130J air tanker making drops of retardant (I recommend fast-forwarding to 4:00). The tanker is guided to its target by a smaller lead plane, and it’s interesting to hear the chatter among the pilots. Unfortunately, they haven’t figured out how to turn off the “landing gear” audible warning. If you’re curious about the blaze’s footprint, ESRI has posted an interactive map of the Rim Fire, including its progression and perimeters of previous burns. Here’s a screen shot (click to enlarge). 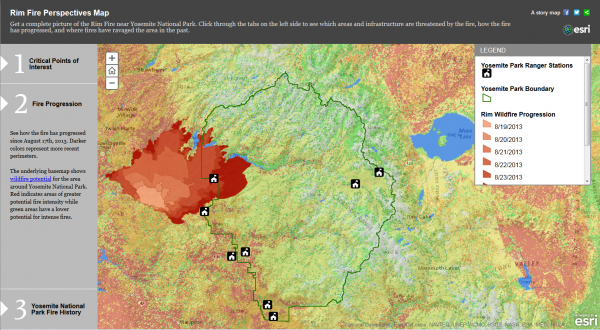 EcoWest contributor David Kroodsma has put together an animated map of the fire’s progression. The Rim Fire is currently the seventh-largest wildfire in California’s recorded history. 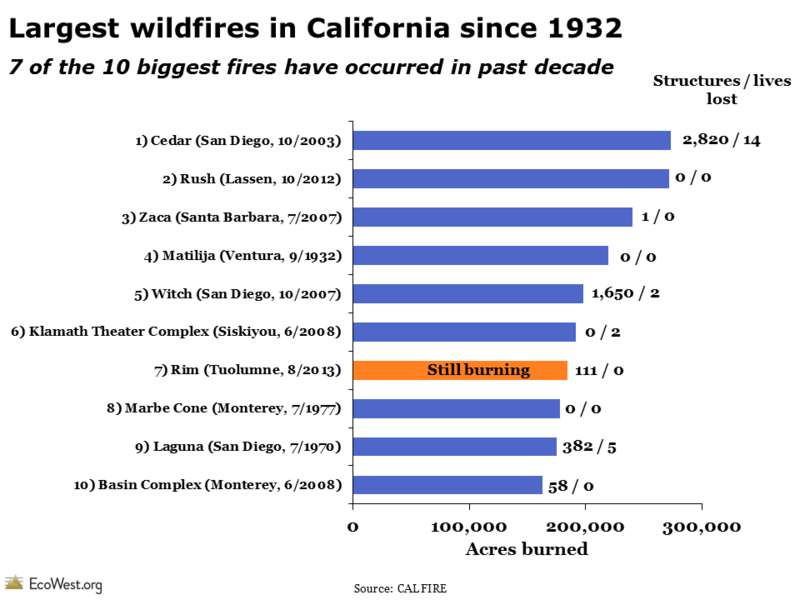 Cal Fire says its data goes back to 1932, and the graphic below shows that seven of the 10 largest fires have burned in the past decade. As Cal Fire notes, there were big wildfires prior to 1932, and we know from tree-ring records and other research that lightning and Native Americans would start fires that sometimes grew very large. 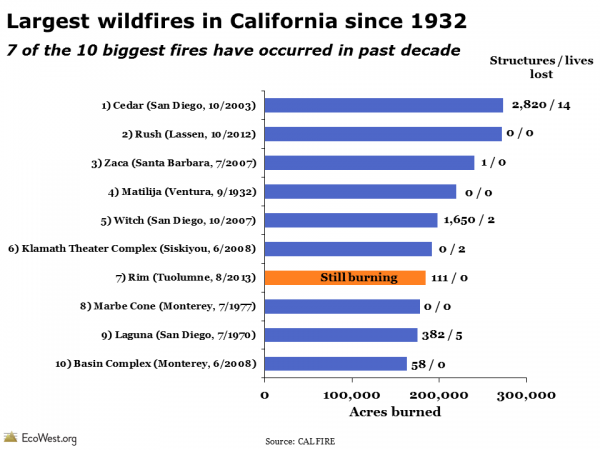 The Rim Fire is less than a quarter contained, so it may well rise in the rankings. 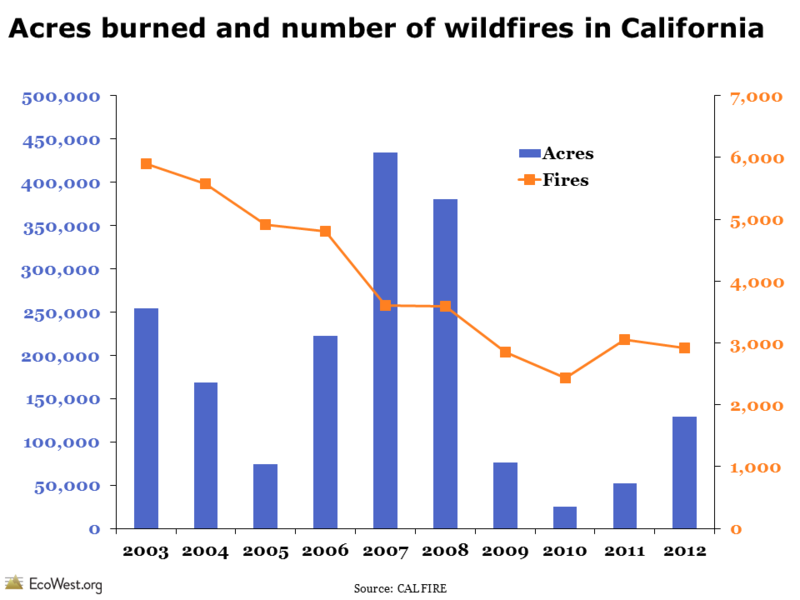 Looking back over the past decade, there has been a downward trend in the number of wildfires in California, something that isn’t seen in the national-level data. 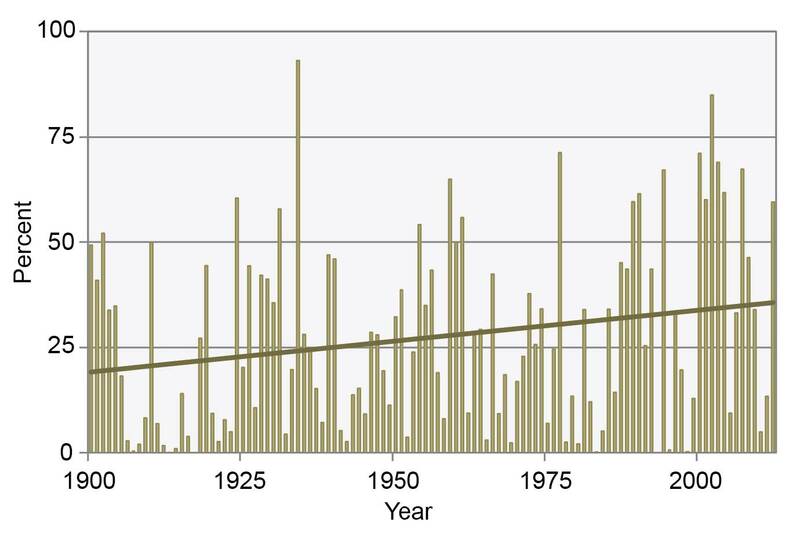 The number of acres charred by fires has varied considerably from year to year, but the previous four years were relatively tame. Cal Fire provides greater detail on the cause of wildfires than the National Interagency Fire Center (we present that data on this dashboard and this post). Below is a summary of wildfire ignitions in California. Lightning starts relatively few fires in the state and the cause of many blazes is never determined. The Rim Fire’s cause is under investigation. 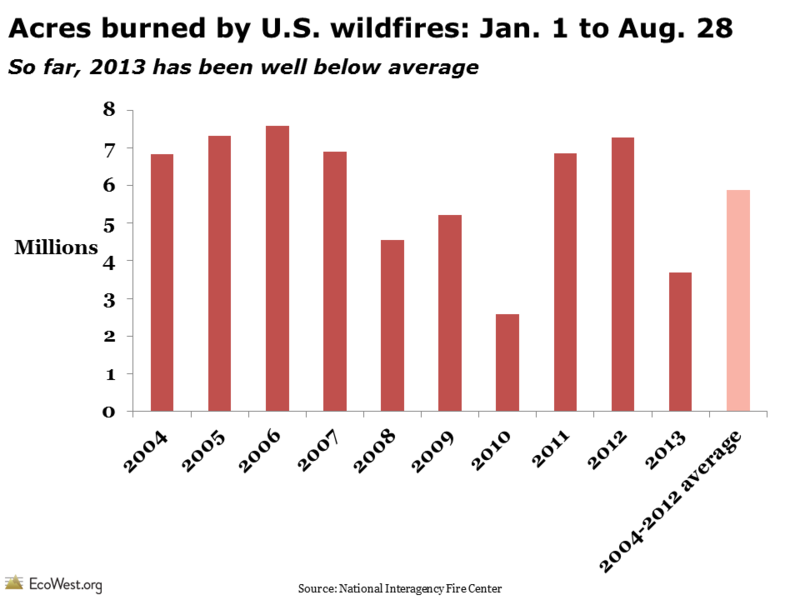 The Rim Fire and the deaths of 19 firefighters in Arizona in June will make 2013 a historic fire season, but in something of a paradox, 2013 is on track to be a below-average year for fire activity on the national level. The graphic below, based on data from the National Interagency Fire Center, shows the acreage burned each year from January 1 to August 28. 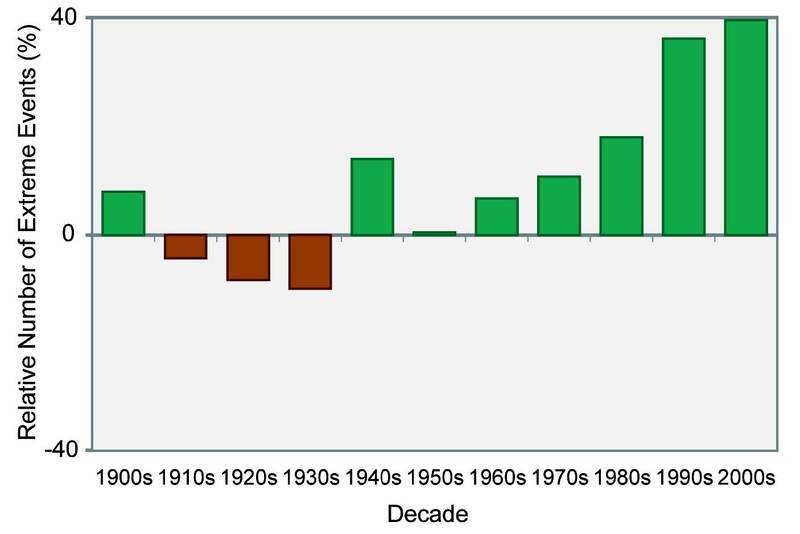 So far, 2013 is the second lowest total since 2004. The 3,686,318 acres that have burned this year is just 63% of the 2004-2012 average. We’ve still got a way to go in the 2013 wildfire season, but many areas in the Southwest and Southern Rockies have received a good soaking over the past two months, so they are unlikely to add to the total in any big way. Going forward, the potential for large fires will be greatest in California, Nevada, Oregon, and Idaho. One of my main takeaways from analyzing wildfire data is that the numbers can jump around from year to year, and we shouldn’t put too much stock in any single data point. 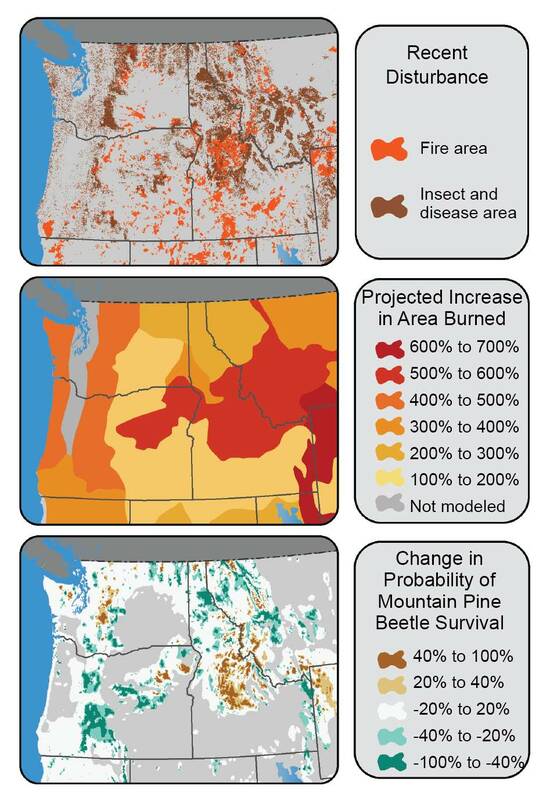 Relatively small fires can kill people and destroy hundreds of homes, while enormous blazes in wilderness settings can do wonders for ecosystems. 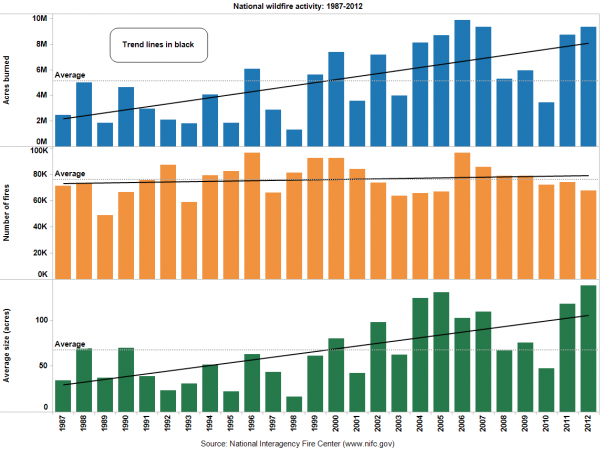 Overall, the trend in recent years has been toward larger fires and more acres burned, as shown below. What’s not captured in these raw acreage totals is the real impact on the ground. What fraction of the landscape was nuked? How many acres are better off after a low-intensity burn? Reports from the fire lines and the imagery shared above suggest the Rim Fire is burning very intensely and could do considerable damage to the park’s resources and nearby residents’ homes. Whatever the final acreage total, blazes like the Rim Fire are likely to become more common in the years and decades ahead, according to climate change projections. 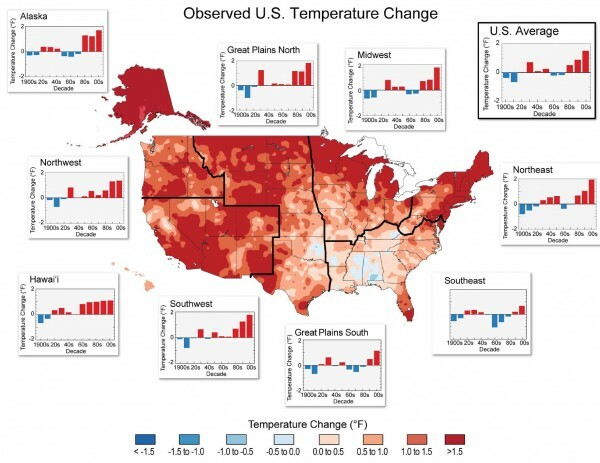 Andrew Freedman has a good discussion at Climate Central, which also provides this embeddable data visualization on Western wildfire trends. 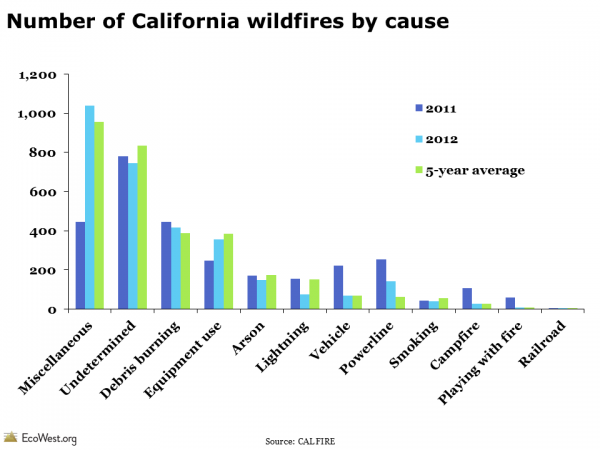 Data on California fires comes from Cal Fire and its 2012 red book. The agency also has PDFs showing the largest fires in terms of acres burned and structures lost. The National Interagency Fire Center provides year-to-date totals for fires and acres burned on this page.